When I really should have been making last minute preparations for two full days of meetings and presentations for my “day job”, I procrastinated a little bit longer and mapquested just how far I drove and how long I had been in the car for the past 10 days. The sum: well over 28 hours and somewhere in the 1500 miles range. From my apartment in Farmington, Connecticut to a weekend training on the Schuylkill River in Philadelphia, to the USRowing Club National Championships in Indianapolis, and finally to Charlotte, NC for two days of ESPN meetings, it has been quite the roadtrip. While in “windy Indy” I managed to snag 2 Bronze and 2 Silver in the 4 events I competed in (Bronze in Intermediate 4x and Intermediate 1x, Silver in Intermediate 2x and Senior 1x). I am most proud of that Silver in the Senior 1x — managed to beat out one of the women who put me in 3rd for the Intermediate 1x the day before (and technically, Senior 1x is the better race). Redemption. It was a great week — lots of racing (11 2Ks total), some races better than others. But the goal was to get my strokes in and try and come away in the top 3 in as many races as I could. Goal(s) achieved. The roadtrip continues. 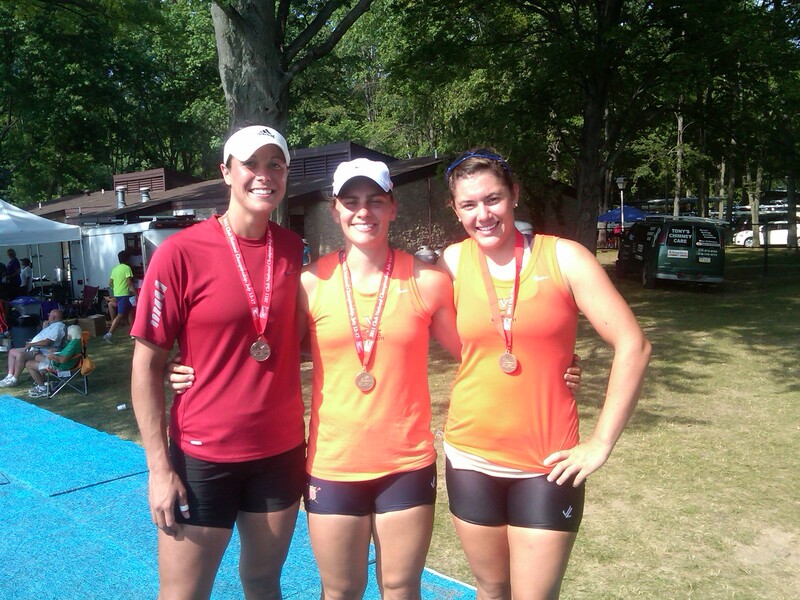 Women's 1x and fellow Virginia Wahoos! Way to go Meghan!! Your hardwork, commitment, and heart are all paying off! Keep digging deep and working hard. Awesome job! Slam dunkin like Shaquille O’Neal, if he wrote ifnoartmive articles.